Another brutal winter is looming on the horizon. It seems that average snowfalls are increasing while winter temperatures are decreasing for much of the country, and climatologists are predicting heavier than normal snowfall and colder than average temperatures. . Fortunately, there are steps you can take now to deal with brutal winters – especially when it comes to protecting your roof and home from snow and ice damage. 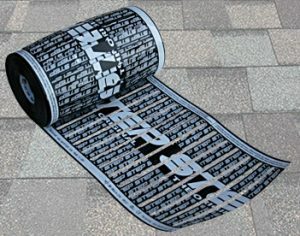 The RoofHeat STEP system features a unique and highly effective low-voltage heating element that can be installed discreetly under shingle or even metal roofs to prevent ice dams from forming and facilitating runoff in roof valleys. The system utilizes a thin polymer heating element that can be nailed and stapled through, and cut on site, facilitating quick, easy installation. The flexible heating element is polypropylene fused during fabrication to ensure that the panel is protected against UV rays and other potential damages. Installing the RoofHeat STEP roof deicing system along the edge of the roof can eliminate ice dams from forming. Ice dams are by far the biggest culprit when it comes to costly roof and water damage. Ice dams typically form when heat escapes the attic to warm the snow on the roof. There, it melts during the day and trickles down towards the roof edges. Because there is no attic along the roof edges, the roof is colder and the water refreezes near the edge of the roof. Each day more water runs down to this point and accumulates near the roof’s edge to form a considerable dam of ice. As water pools behind the dam, it can seep into small cracks and expand as it refreezes, causing damage to the roof and even finding its way into the home. This is where expensive water damage can take place – often beginning well before the homeowner is aware of any problem. Panels can be nailed or stapled through (but do not penetrate the bus braids. Low-voltage, self regulating system is extremely energy efficient. Different panel widths are available to heat roof edges, valleys and gutters. The system is fully automated and operates quietly. Heating element comes in rolls that can be installed quickly and easily. The heating element is installed discreetly under the shingles. The versatile heating element can be installed under metal roofs. Warmzone includes professional system design and installation support services. To view a system installation overview, visit the Installing Heated Roofs general overview web page. Contact a Warmzone representative at 888.488.9276 for more information on our industry leading roof deicing solutions. There are many options available, and Warmzone will design a roof heating system that is tailored to your specific roof heating needs. Call for more information or send us your project details for a free quote. According to climatologists, a colossal weather event is brewing in the Pacific. Every few years, the Earth’s winds shift and the water in the Pacific Ocean gets warmer than usual. This effect, called an El Niño, not only affects winter in the U.S., but can also impact weather on a global scale. According to climatologists, conditions in the central and east-central equatorial Pacific ocean are showing the potential for a record-breaking El Niño weather event. While predicting the weather is still somewhat of a guessing game, scientists are confident that this El Niño is going to impact winter weather in the U.S. – to what extent, we can’t say for certain. But given the current conditions in the Pacific, meteorologists are warning U.S. residents of a potential record-breaking El Niño. According to the Old Farmer’s Almanac this year’s El Niño will deliver a wetter than normal winter to much of Northern America, as well as impact weather conditions on a global scale. The weather reference book predicts “super cold temperatures with heavier than normal snowfall” for much of the country. With recent and projected winters of increasingly colder temperatures and heavier precipitation, consumers are searching for reliable, round-the-clock snow removal solutions. 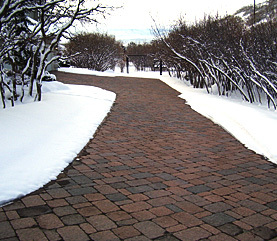 Automated heated driveways and snow melting systems have proven to be the answer for many businesses and homeowners. ClearZone snow melting systems have long served as the best, most trusted method for keeping driveways, sidewalks, ramps and steps free from snow and ice buildup. The snow melting systems feature industry leading heat cable and state-of-the-art snow sensors and controllers combined with professional system design and installation support services. By teaming with Warmzone, customers have the peace of mind knowing that they are dealing with experienced professionals who go the extra mile in terms of customer service. By providing a detailed AutoCAD of the snow melting system, installers know all the technical information such as power requirements, breaker sizes, etc., prior to any installation taking place. And Warmzone’s dedicated installation support experts are on hand to assist you during the installation process if you need. At Warmzone, we do much more than sell radiant heat systems. We understand that a snow melting system is only as good as its installation. While industry leading heat cable and components are important, they are of little benefit if not installed correctly. That’s why Warmzone insists on providing unparalleled customer support and installation services. And in addition to receiving your system design and installation support, Warmzone also offers free installation training courses. Installers may call Warmzone and receive personal training online or visit Warmzone headquarters in Salt Lake City to attend training courses in person. After the training, installers receive a certificate of completion from Warmzone, and future projects can then be referred to those trained installers with experience. This not only helps installers gain more business, but helps homeowners by referring construction professionals who have been trained and are experienced when it comes to installing radiant heat systems. Given Warmzone’s unmatched customer services and top tier products, it’s no surprise why Warmzone is a favorite among professional builders. So if you’re looking to install a heated driveway – or floors, or roof deicing system – go with the experienced pros who will stand beside you throughout the design and installation process. Installing a radiant heat system is a smart investment in your home, so do it right and go with the friendly professionals you can trust – Warmzone. For more information about Warmzone products and services, call888.488.9276.